Chinese dairy producer Inner Mongolia Yili Industrial Group Co Ltd unveiled the second phase of its Oceania Production Base in Auckland, New Zealand on March 25, 2017. Auckland in the country's North Island is famous for its natural environment and large dairy industry. 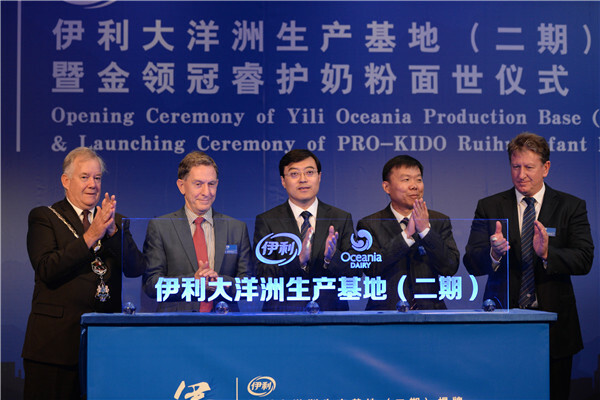 Yili chose the city to set up its Oceania Production Base, the world's largest integrated dairy plant in 2014. With an investment of 3 billion yuan ($400 million), the production base can produce 56,000 tons of whole milk powder, and 30,000 tons of baby milk powder each year. The production base chooses its milk suppliers using a strict quality supervision system to ensure food safety, said General Manager Roger Usmar at the unveiling ceremony. A new milk powder product PRO-KIDO Ruihu infant formula was also announced during the ceremony.